Will you manage to guide all the water from the mountains to the sea without losing a single drop? On the way, you'll have to cross cities, farms and factories. The water will get polluted and your mission will get harder! Water Cycles, the new app from isygames, is a fun family game, packed with over 150 puzzles at six difficulty levels. Every new challenge is designed to help you gain an intuitive understanding of why water is so important in our lives – how it changes state, how it moves, and what we need it for. And all while playing a fun game! The app comes up with a new puzzle every day so you can earn the stars you need to level up! Water Cycles also includes a Map Editor to design your own maps. Place villages, cities, farms and factories wherever you want. Do your own thing! The main challenge in the game is to guide water from the mountains to the sea, through cities, towns, crop fields, forests, farms, marshes and factories. It won't be easy, though! You have to transport the water everywhere it's needed, and it will get dirty, drain into the subsoil and even pollute the groundwater. Your goal is to carry the largest possible amount of water to each waypoint in the game, while keeping it as clean as possible. Finally, guide the water into the sea. Your performance at each step will earn you one, two, three, four or five stars. And the water droplets will jump for joy! The interactive module "What is the water cycle?" 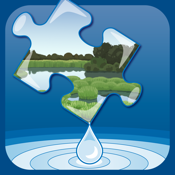 is an easily grasped learning resource that helps you understand the basics of the water cycle in all its phases, from evaporation through to the return to the oceans. Ease of use makes it a great choice for home or classroom-based teaching. The whole family will enjoy the water challenge while learning about pollutant human activities and the vital importance of water as a resource. - Includes external link to our Website hidden under a parental door. Isygames is an innovative company based in Madrid, Spain, that develops game-based educational apps for devices running the iOS operating system. The team comprises parents, publishers, teachers and videogame developers. Isygames' goal is to create a range of education/entertainment objects aimed at children of all ages. All of our apps are designed for classroom use, with supporting texts written by education professionals.